Kids, cults are a dangerous thing. When you’re a child, you should be taught this, just as much as you learn “look both ways before crossing the street” and “don’t play with fire”. Clearly all lessons that you don’t learn when you’re in the Cooper family (but I suppose when one parent is a serial killer, maybe you’re off the hook). Betty has decided, though, to go against all common sense and really go for the Farm. After attending an opening day at the Farm with Veronica, she manages to convince Cheryl to go to the Farm as her spy. Betty thinks this is a good idea because Evelyn already tried to sign-up Cheryl for the cult fun squad. But this is of course a very bad idea just because Evelyn already tried to recruit Cheryl. Cheryl enters the Farm premises with full determination to learn more about her head brother, Jason. She wears a mic to her interview where she manages to have a chat with Edgar. He listens to her, and he gets to the heart of her issues following Jason’s death. Betty learns from listening in that Edgar records all of his conversations with the Farm members. And, unsurprisingly, Cheryl becomes infatuated with the cult. Betty tries to get Cheryl to leave to no avail. But she does break into the Farm and steal back the tapes from her family and Cheryl. But even when she tries to get Cheryl to leave, Cheryl admits she doesn’t want to go because she’s “seen” and spoken to Jason in the flesh. Which, considering how long he’s been dead doesn’t really sound ideal. But it does get to the heart about why people are obsessed with the cult. Betty adds the new information together and realises that her mother is so attached to the cult because she gets to see her dead son. Archie, with Veronica’s help, manages to convince the governor to release the young men. The boys all go to stay at Archie’s new boxing gym. Giving them a home, but not really any purpose. But Mad Dog brings worse news: his family’s apartment have been taken over by drug-making Gargoyles. Jughead agrees to help Archie remove the gang from the building. This is one of the dumbest ideas that the boys have ever had. Jughead continues to be in hot water with his parents. One for trying to destroy her drug business and the other for getting in the way of his drug-busting. But the boys go into the apartment building anyway. And it’s hardly surprising when the Gargoyles react with guns a-blazin’. Nothing really comes of it other than a lot of scrapes and bruises. Following the unsuccessful purge, Mad Dog admits to Archie that he wants to box for Elio. He gets a house out of it for his grandma and little brother. AND he gets paid! For an ex-con, it doesn’t actually sound like a bad deal. Even if Archie isn’t convinced. Why aren’t we getting any scenes of Veronica acting as a child? She’s always been the most mature of the group, but parading around as a business woman while trying to salvage her parents’ marriage is a little bit tedious. The mafia plotline of season 2 was definitely the worst, and continues to be the worst thing about season 3. I JUST CAN’T CARE AND I’M OVER IT. She decides to send dead fish to her mother, in hopes of convincing her father to stay and “protect” Hermione. This apparently works, but I suppose if you’re in a mafia, you deal with the fallout? Either way, no one made the best decisions they could this week. Jughead in particular is getting a bit tedious. What happened to the “I’m a weirdo” weirdo? This birthday-hating child has become a full-on blockhead almost to the point where his motives don’t make sense anymore. I love Heathers. It’s a truly oddball one-of-a-kind movie that has a black comedy that many movies have tried since to duplicate and failed. Now I have never seen Heathers: The Musical but I would assume it has all the components that put it in the same, twisted vein as its source material. In last week’s episode, Cheryl demanded that Kevin change the musical to Heathers in order to get out her mean girl frustration. The Farm gets behind it, funding much of the musical. That also means that Evelyn Evernever finds herself chosen as Kevin’s co-director (much to Betty’s dismay). And speaking of dismay, Cheryl learns that Toni is in charge of choreography. The two former-girlfriends begin to battle it out for territory in a power struggle both on and off the stage. The Farm hosts a cast part before the show (which is just wrong) in which the actors are all encouraged to wear their costumes for the show. This is easily the most out-there detail of Riverdale yet. Name ONE show in the history of theatre that ever allowed the actors to party in their costumes before they even hit the stage. At the party, the kids get loose. Veronica gets cozy with Reggie again after she learns the news that her parents are splitting up. And Archie and Josie make their canoodling public. This, of course, leads to more complex discussions. Reggie isn’t entirely pleased with being Veronica’s go-to. But Archie and Josie begin to make their relationship more official (and I am HERE FOR IT). Jughead, meanwhile, continues his quest to end his mother’s attempts at making a foothold in the Riverdale drug trade. He soon discovers that Gladys has turned their former trailer into her drug lab. Together, Jughead and Betty go to the trailer together and burn it down. Betty has proven yet again that the kids in Riverdale have an unhealthy relationship with arson. Evelyn spends much of her time using her power to force the actors into vulnerable places. She’s a total creep, but in an approachable way. An approachable creep from a cult. That’s actually a thing, I guess. But Betty knows that the Farm is just using the musical as a way to indoctrinate more people into the cult. And at the very end of the performance, we see the cult in all their white-garbed glory in the audience. To be honest, Riverdale hasn’t done a very good job at explaining why the Farm is so appealing. I think it’s supposed to be something about salvation and belonging, but it never seemed convincing. Now that we’ve see Chad Michael Murray revealed as cult leader Edgar Evernever IT ALL MAKES SENSE. Overall, Heathers: The Musical was probably the perfect choice to cement Riverdale’s attempts at returning to normal. It suited the storylines very well. That being said, though, I did have more fun with the Carrie musical episode. But you know, I prefer murder over arson. PS: Why the HELL is there some kid at the cast party dressed like the Gargoyle King? One (major) thing I forgot to mention in last week’s recap was that Tall Boy was killed by his fellow Serpents. On accident, of course. Leaving Jughead to cover their tracks. This death (that I conveniently forgot) was key in this week’s episode of Riverdale, which was an hour-long, not-so-subtle homage to the noir genre. With Hiram in the hospital and Claudius dead, the children scramble to put together the pieces of the puzzle. Everyone but Archie, that is, who spends most of his screen time starting fights and getting drunk. Veronica, on the other hand, gets straight to work trying to find out who shot her father. She goes to Jughead to pay him for his help, and he willingly agrees. His first stop is Hermione, who is rather open about the affair that Hiram was having with another woman, which was why Veronica heard her parents arguing one day. Jughead heads out with Betty to locate the blond mistress. Instead, they come across the members-only Maple Club, run by Ms Penelope Blossom herself. Betty tries to interrogate Penelope about Claudius’s death, but the kids are eventually turned out. But a quick visit to Betty’s favourite medical examiner. She learns that Clifford Blossom had a secret autopsy done on his body before it was cremated. The examiner tells Betty that he died of poisoning, not too different a fate from his own brother. When Betty confronts Penelope again, this time armed with hard evidence, Penelope admits to murdering all the horrible men in her life. She explains to Betty that Claudius was poisoning Sweetwater River with the run off from producing Fizzle Rocks. With the water tainted, the women of Riverdale had begun to experience seizures as a side effect (Mystery #1 solved). When she lays out her reasoning, Betty starts to understand the woman more. And even more – Betty doesn’t turn Penelope (“The Scarlet Dahlia”) in. Jughead eventually corners the Hiram’s lady (played by actor Mark Consuelos’s real-life wife Kelly Ripa). He confronts her with the information he had about river, siting that the environmental impact work had been forged – by her, a health and safety inspector. By not denying anything, she confirms his suspicion: she was paid by Hiram to keep things quiet. After, Jughead receives a call from Sweetpea, who had been tailing Hermione. Together the two follow her to a cabin where the see her together with none other than the dead sheriff himself: Minetta. While eavesdropping, the Serpent boys learn that Hermione gave FP the sheriff job for one reason – to frame him. When Jughead goes to warn his father, FP admits that he was paid by Hermione to shoot Hiram. But conveniently Jughead has Tall Boy’s dead body to get rid of. The Jones men work together with Alice to pretend that Tall Boy had been killed in a confrontation with police after shooting Hiram. Mystery #3 is also in the books. And that leaves only Archie left. After a pep talk from Josie, Archie decides to pay his nemesis a visit the hospital…while bringing a gun. But after his revenge monologue, an actual black hooded hitman waltzes in. And before he can shoot Hiram, Archie gets the man in the arm. Veronica is more than please, and thus willing to forgive Archie to a point. While Archie makes his peace with Hiram, Veronica sneaks off to burn her parents’ very-expensive stockpile of Fizzle Rocks before it can be sold to a new dealer. While many of the shows mysteries are solved in this episode, many of the characters are left unsatisfied. Left in a place of limbo. And so is the show. 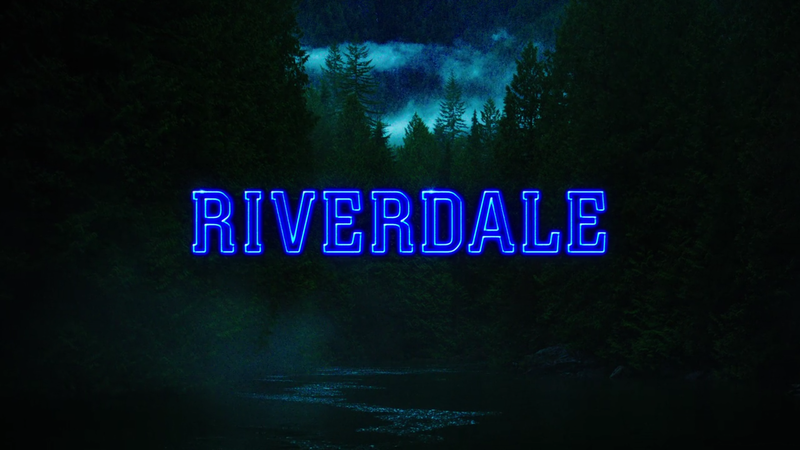 While it keeps its constant style-changing ways, it really feels like Riverdale is trying to wind back down to something smaller. Poor Archie is being given the absolute scraps from the writing room. Someone please figure out what to do with his poor boy.